On December 6th at London Docklands Arena, Eurythmics concluded their outstanding 'peacetour'. All proceeds from which went to 'Greenpeace' and 'Amnesty International'. This programme captures that event in all its atmosphere and brilliance. DVD: Widescreen 1.77:1/16x9; audio English DD 5.1 & Digital Stereo; subtitles none; single side - dual layer; 21 chapters; rated NR; $24.98; stree date 6/27/00. Supplements: PeaceTalk: 60 Minute Documentary Featuring Five Tracks From The 'Peace' Album; Multi-Angle Tracks; Lyric Screens; Interactive Discography; Picture Gallery; Weblinks. As I watched the otherwise-terrific new DVD called Peacetour taken from Eurythmics' 1999 tour of the same name, I found myself actively craving more and more shots of the crowd. Why? Because yours truly attended this December 6 1999 concert in London and since he resided in the front row, he hoped to see his ugly mug in all its digital glory. Alas, that was not to be the case, likely due to the fact that although my seat was indeed right next to the stage, it was pretty far to the left. (Kind of like Teddy Kennedy. Woof! How's that for raucous political comedy, huh?!) At most indoor venues, the portion of the stage on which the performers usually romp extends from one side of the floor to the other, but not here. Unlike most American halls, the Docklands arena offered an extremely wide floor that resembled the breadth one would find at a stadium. As such, I was in the front row, but my seat was too far to the left to be tremendously close to the actively-used parts of the stage. So let the tears flow - your one (and probably only) chance to see me on a DVD seems to have gone by the wayside. Oh well! It's coincidental enough that I happened to attend the one Eurythmics show that they recorded for video release, much less came close to a position in which I might have been captured on camera. You see, I'm not much of a fan of Eurythmics. Actually, prior to this show, I barely even cared about the band at all. I owned none of their records, although I bought two solo singles from singer Annie Lennox. I maintained no sense of animosity toward the duo of Lennox and Dave Stewart, but during the sixteen years since I became aware of their music, I never felt much interest in them. So why in the world did I attend one of their concerts that happened thousands of miles from home? Put simply, I had nothing better to do. I made my first-ever trip to England last December specifically to attend a series of concerts by an act that will remain nameless. I was to see six performances by this group; that would leave me three nights without any shows to attend. But then I discovered that Big Country - a long-time personal favorite I'd rarely seen because they almost never play the US - were putting on some shows in the UK, so I added one of those concerts to my roster. That got me to seven shows in nine nights. It may sound pathetic, but I love to attend enough concerts to make my personal "numbers" work out distinctly. The last time David Bowie toured in 1997, I went out of my way to get in six shows because I wanted to get to an even 50 for my "career". That's why I'm disappointed I "only" was able to see Springsteen 14 times on his current tour; one more would have made it a neat 25 for my lifetime. None of the shows I would attend in England could elevate my "career statistics" to any milestone plateaus, but the sheer frequency of the concerts did create a unique opportunity for me to see more shows back to back than I'd ever deemed possible. Prior to December 1999, I don't think I'd ever done more than four shows in four nights. In 1995, I saw Bowie eight times in eleven nights, but nothing else filled in those other days. Because I'm so fascinated with these inane statistics, I decided that if I could find interesting acts on my two "nights off", I'd go to those concerts to fulfill my ambition of "Nine in Nine in '99". The later open date - December 10 - was easy, as I had my choice of either Elvis Costello in London or Pet Shop Boys in Manchester. (I was already in Manchester and would be traveling to London for the last two shows of my "tour", so although the cities are nearly 200 miles apart, that distance wasn't a consideration; my choice just affected when I'd go to London, not if.) I much prefer Elvis, but the show was sold-out. Although - as you'll soon discover - the "sold-out" designation can be meaningless, I decided to go with the sure thing and saw PSB instead; I don't particularly like them, but I thought it'd be an interesting show, and at least it was something new, whereas I'd already seen Elvis nine times over the years. The final open date - December 6 - was more clear-cut, as Eurythmics were the only even mildly compelling act playing in England that night. Besides, I'd wanted to zip down to London for a couple of days in between the initial four shows in Manchester, so the concert made sense. Technically, the show had been sold-out for weeks, but as I already stated, that designation means little, especially in England, where tickets - and often excellent ones - re-enter the system all the time. In the US, it doesn't matter if you contact the box office or any of the billions of Ticketmaster outlets; all seats go through the same computerized source, but the same does not apply in the UK. TM apparently holds sway over most of the seats, but a number of other sources - including the box offices - have their own allotments, which makes things more interesting. This means that you can find distinctly different seats depending on the outlet you contact. This system seems to work well for those who are patient; although I didn't get some of my tickets until very close to the day of the show - or on that day itself - I never once sat farther back than the eighth row for the eight reserved concerts I attended. (Big Country was general admission.) Twice I got my seats the day of the concert, and two other times I bought my tickets a few days ahead of time. Seven of those eight shows were supposedly sold-out; only PSB didn't receive that title. So let that be a lesson to our British readers - patience really can be a virtue. I called the Docklands box office about four hours before showtime and ended up with a seat in the front row. It may have been too far to the side to get me on camera for the DVD, but I won't complain too loudly. Oh yeah - the DVD! I was supposed to talk about that, wasn't I? Peacetour provides a pretty standard video of a concert with little to differentiate it from other similar programs. (Excepting some of the cool DVD features which will be addressed later - these comments concern the core video itself.) The "Peacetour" itself marked the first time in a decade that Lennox and Stewart had toured together, and it was a brief outing, so you're forgiven if you didn't know they'd hit the road. 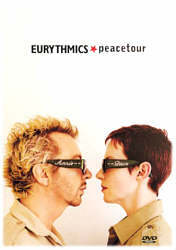 Eurythmics played only 25 dates on the tour, and 11 of those took place in the UK; only two American dates - one in New York and one in Los Angeles - occurred, with three others in Australia and the remaining nine in continental Europe. Although Eurythmics technically toured behind their new album Peace, the show leaned heavily toward the hits; four of the 21 songs were from the new release but the rest stuck closely to the tried and true. I'd be curious to know how die-hard Eurythmics fans felt about this. I know that I was pleased with the set because it meant I actually recognized many of the tunes; my knowledge base of Eurythmics music was - and remains - so basic that the presence of anything other than golden oldies would have left me completely lost. Although I personally was happy to hear some songs I knew, I nonetheless prefer acts to play more challenging sets because I can empathize with the Eurythmics die-hards who really didn't want to hear so many of the tried and true songs. Granted, with ten years between tours, these fans were probably just happy to see the band at all, but I know if I'd been in their place, I would have felt disappointed with the popular nature of the set. The best shows combine a balance of new songs, hits and more obscure oldies. Peacetour packs in four songs from Peace but the rest are all well-known tracks from the band. I suppose my criticism may be unfair to a degree. After all, these shows represented Eurythmics' first dates together in a decade and were played at large venues to benefit charities (Greenpeace and Amnesty International). As such, the generic nature of the setlist probably makes sense, though if Dave and Annie continue to work together to a significant degree - it seems unclear if this is essentially a "one-off" deal or if they're back together full-time - I hope they'll get more ambitious in future performances, even if it means I won't recognize some of the songs. Despite my reservations about the sets, I did enjoy this concert in person enough to develop a minor interest in Eurythmics. Soon after the show, I bought a copy of their Greatest Hits compact disc, and I also didn't hesitate to acquire this DVD. To be frank, this is probably about as far as my fascination with Eurythmics will go. As you can infer from the number of times I've seen Bowie and Springsteen, when I like an act, I really go nuts, but that won't happen with Eurythmics, since I only think they're okay. So the Peacetour DVD works well for me; between it and the Greatest Hits album, my Eurythmics desires are largely satiated. If they tour again, I'll definitely see them, but I doubt I'd grab any new records. I should note that the songs from Peace went over quite well. In fact, those tunes were so well-received that I thought some of them were old hits I didn't remember. For example, "I Saved the World Today" got such an enthusiastic "sing-along" greeting that I didn't even know it wasn't an oldie until I got this DVD! Peacetour stands as a fairly adequate record of the live performance. It wasn't a great show, as it was more modest and less theatrical than I expected. Nonetheless, Lennox proves to be a strong frontwoman. It takes her a few songs to warm up - she seems a bit stiff and self-conscious in the early-going - but before too long, she proves herself to have a formidable stage presence. Her voice generally sounds quite good; it's a powerful instrument that falters a few times during the concert, but ironically, her errors usually suit the songs by making them seem more intimate and allowing her to look more vulnerable. Make no mistake - Lennox is virtually the entire show here. Stewart romps about as he plays guitar, but he has little presence, and their backing band seem competent but dull and without much spark. That's why the production really would have benefited from a more theatrical bent. I can understand that perhaps they wanted a "cause related" performance to stick to the basics, but the fact that this tour marks their first protracted jaunt in so long means that it might have worked better with more glitz to back them up and bolster them. I'm not one for style without substance, but substance without style is little better. Happily, Lennox has enough style to make the show work - I just think it could have been better. Musically, the concert seems satisfying, with some nicely-rendered songs. Eurythmics are really an act who work better in the studio; some of the rough edges that inevitably occur during a live performance don't help their music. Nonetheless, the slightly-ragged quality I discerned at times doesn't do much to harm the tunes, and I was pleased to hear that they spiced up many of the songs and didn't rigidly adhere to the original recorded versions. If all of this sounds like a terribly luke-warm recommendation, I should probably alter my tone, because I really did enjoy Peacetour. I'm just such a concert buff that I have very firm ideas of how I think shows should work, and I'm very ready to criticize acts who I think fall short in any way. Despite my feelings in that regard, I think that Eurythmics put on a pretty solid show, and Peacetour provides a good representation of it. Peacetour appears in an aspect ratio of approximately 1.77:1 on this single-sided, double-layered DVD; happily, the image has been enhanced for 16X9 televisions. The show offers a pretty typical videotaped picture that looks quite good overall but lacks the spark necessary to make it an "A" level production. Sharpness usually seems crisp and well-defined; though some mild softness can affect wider shots, it's never tremendously problematic. Moir� effects don't appear, but I did witness a fair number of jagged edges, evident in objects like fretboards and the rim of the stage; a lot of these featured the "ropiness" that sometimes accompanies the anamorphic downconversion on my 4X3 TV. I witnessed no flaws from the videotape itself, so the entire show looks clean. Colors appeared appropriately saturated and accurate, with no signs of bleeding even during heavier instances of red lighting. Black levels were decently dark and deep, and shadow detail is not a problem. Really, the only time shadows come into play are during crowd shots, which can be hard to discern but I won't fault the production itself for that, as views of the audience aren't a focal point. (Though considering that I was there, they should have been!) All in all, Peacetour looks very good and offers little to dislike in the visual realm. Also good but not great is the show's Dolby Digital audio. On the positive side, all vocals - Annie's leads plus the backing singers - come across as distinct, clear, warm and natural. The instruments themselves tend to appear slightly muddled, however. Actually, "muddled" may not be the best word, but I felt that the mix seemed more dense than it should in regard to the instrumentation; other than Dave's guitar, none of them appeared as distinct and separated from the others as they should, which lends a slightly thick quality to the track. As such, the stereo separation is acceptable but not great. Actually, the various instruments are solidly placed in their locations, but the overall thickness of the mix makes them harder to distinguish. The rear speakers are reserved mainly for crowd noise (at appropriate times) and also provide a reverberating reinforcement of the music from the front; as far as I could tell, no discrete instrumentation or singing emanates from the surrounds. Bass levels were acceptable but not as deep as I'd like. Despite my criticisms, Peacetour does sound quite good, but as with the picture, some small problems keep it from earning an "A"-level grade. One wonderful part of this package is the fact it packs in many more supplemental features than are typical for a concert DVD. In general, you're lucky if you get lyrics and a discography. Peacetour indeed includes those - about which I'll relate more later - but it also gives us a whole lot of other stuff as well. Most significant is "Peacetalk", a 60-minute documentary about Eurythmics. The program features numerous interview clips in which Annie and Dave talk about the tour, the album, and the past, plus we find quite a few performance clips. The piece starts with a couple of songs from a press conference in London, but almost all of the other tunes come from band rehearsals. We also hear a few songs that are performed on a couch during the interviews; Dave plays acoustic guitar and Annie sings. Overall, "Peacetalk" is a good program, and I learned a little about the band, which wasn't hard since I don't have a great knowledge base. However, I thought the interviews were a bit sparse; they flitted from subject to subject and didn't provide a very coherent idea of many topics. Also, the music clips are good to have - they sound clear and rich, too - but all except the closing band rendition of "17 Again" are interrupted by interviews. Some of these bits don't run over much of the songs, but I found it irritating nonetheless; it's a nuisance to hear only parts of tunes. I liked "Peacetalk" in general, but a few small changes would have made it a much better program. One of the most noteworthy supplements is the availability of a multiple angle selection during two songs: "17 Again" and "Sweet Dreams (Are Made of This)". Helpfully, these two options are listed in the main menu, but you don't have to access them there to try out the extra angles; as you watch the full program, you can flip between the other views to your heart's content. Three angles are available. The first features the standard edited selection that you would see if you bought a non-interactive format like the videotape. However, the others are more interesting, although rawer. Each of the other two restricts itself to one camera. As such, we witness the two songs through the respective camera operator's eyes; when they abruptly zoom in or out to change the shot, or when they lose focus, we see it all. I found these "rough cuts" to be strangely compelling; in an odd way, they gave me a better feeling of "being there" than I've ever witnessed from a slickly-edited concert video. I think that's because though the transitions may be awkward at times, it still sticks to one point of view throughout and we see the shifts in focus. I don't know if I'd want to watch a whole concert that way, but I might, since it's a charmingly realistic way of presenting a show. Peacetour tosses out a few other helpful extras. "Discography" provides one of the best album listings I've yet seen. Some DVDs are content to simply list record titles and maybe will include the year in which the product was released, but this one goes much farther. Each Eurythmics album lists each song on it, plus the month and year of release. Also, each album presents an approximately 30-second sound clip of one of the record's songs, and there are links to the songs that also appear in the concert; click on the link and you'll go directly to the live version of the song. Cool! As good as the discography is, it does have a few odd aspects. For one, Peace isn't listed; the credits stop after Live 1983-1989 (which actually appeared in 1993). 1984 - which came out in, uh, 1984 - also doesn't appear at all, though a minor remix collection of songs taken from 1983's Touch is listed. Odd! Finally, the DVD includes a nice little booklet that lists a brief description of the disc's features plus a few photos of Annie and Dave. While I can think of a few ways to improve this package - an audio commentary from Eurythmics, subtitles during the performances, a historical text in the booklet, some music videos from Peace - I can live without them, for I'm tremendously pleased with what we do find on this DVD; in a market where we find relatively few concert DVDs at all, to get one that tries so hard to pack in a lot of value is a very happy discovery. Over the last 18 and a half years, I've attended some concerts that I can honestly described as "life-altering"; in a few instances, I was so dazzled by what I saw that the performances set me upon a musical path I otherwise would not have followed. Since my interest in my favorite acts can be so intense, it's not hyperbole to term the results "life-altering". That didn't occur at the December 6 1999 Eurythmics show in London. I enjoyed the performance and have followed it up with one Greatest Hits album and this fine DVD called Peacetour, but that's about as far as it will go. Nonetheless, I'm more than happy with that; not every act has to be my be-all and end-all, and I'm pleased to develop a new interest, even if it's for an old band. Peacetour makes for a solid document of Eurythmics' 1999 tour, and the DVD offers very solid picture, sound, and - almost uniquely for a music program - supplements. Peacetour comes highly recommended for fans of Eurythmics or anyone who's curious to give them a whirl; it's easily one of the best concert DVDs yet released and it earns a deserved spot in your permanent DVD collection.